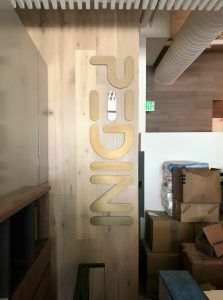 Last week we blogged about the exterior window signs we did for PediniLA’s showroom in West Hollywood. While outdoor signage is important for any business, a showroom’s main focal point is the interior. Especially for a company that is known for their amazing interior work, their showroom needs to be impressive. Along with the designs that they were showcasing, they wanted our help with some wall signs. Many businesses will want to display their company name and logo inside, and outside of the business. The outdoor sign helps people locate the business and advertises to potential customers, but the indoor sign helps set the tone for your business after the customer or potential customer has walked into the room. They had a blank wall that they covered with wood paneling that they wanted to use to display their logo. Instead of typical horizontal lettering, they wanted large individual letters to spell out “PEDINI” vertically. First, we mocked up the letters from aluminum with a dark bronze finish and made the center of the “E” a custom painted blue color. This looked great, but it wasn’t exactly what they were looking for. For the final design that was approved, we flipped the direction of the letters and decided to anodize the aluminum a medium bronze. Instead of painting the center of the “E”, we kept the aluminum color but made it polished. The medium bronze and polished aluminum look great with the color of the wood paneling and the sign is sure to make a great first impression to those walking in. To showcase some of their work that they couldn’t show in person, they wanted high-quality prints of previous work they’d done. 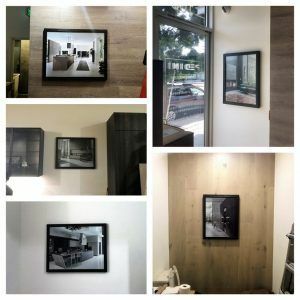 The prints were mounted on a rigid substrate that could go into a custom frame so the images could be put up in numerous places around the showroom. The photos really help to show the quality of the work the company produces while helping customers find inspiration for what they want for their interior design. Digital printing is a great way to to get high-quality images that can be mounted virtually anywhere. As long as the vinyl is being applied to a flat surface, your print can go onto walls, windows, or any flat substrate that can be mounted on any surface. Check out other dimensional letter signs and mounted digital prints we’ve made in the past on our website galleries!